MK Restaurants are all over Thailand. In Bangkok it sure seems like there is one in every block, on every corner, and for sure in every shopping mall. It’s a fast food restaurant that provides quality food at good prices. It’s clean, modern and so easy to love. When I say fast I don’t mean like the hamburger chains, I mean that the food comes fast so you can be in, eat and out in no time. 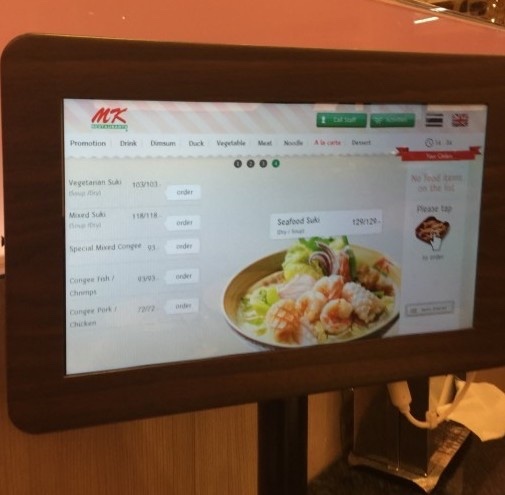 MK focuses on Suki, the Hot Pot type meals where you cook the soup in a big pot at the table and order any number of meats, seafood, and veggies to toss into the soup. They also have terrific Hong Kong Style BBQ duck and Pork served with rick and Chinese greens. And my absolute favourite: Seafood Sukiyaki. I love their hi-tech menu screen where you can order with your fingers. Of course I order Seafood Sukiyaki. MK staff serve everyone Thai ice tea that is really delicious. The glass constantly topped up and it’s free. How good is that in a country that is sweltering hot even in the cool seasons! 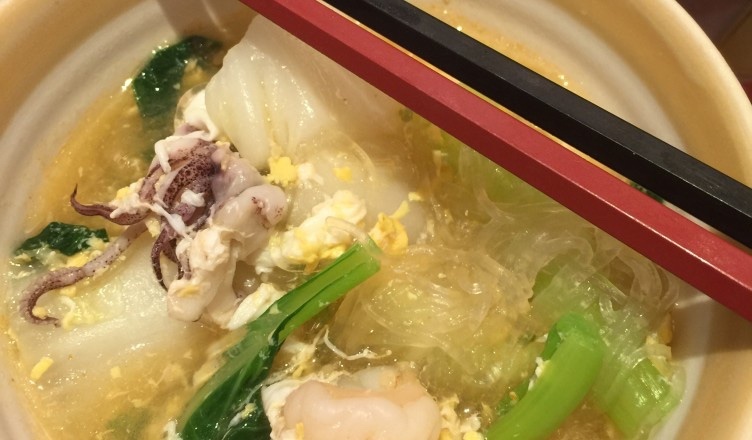 The soup comes in a big steaming bowl full of seafood, veggies and noodles. It’s served with the most delicious dipping sauce, miraculously called Sukiyaki Sauce! This sauce is so good that I just toss it all in the soup and ask for a refill. They love giving refills at MK. 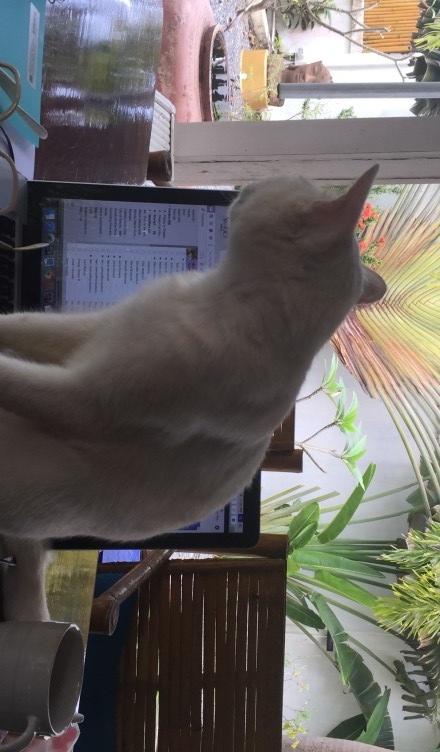 Even if you don’t ask, they bring it. I like to use the small rice bowl they have at each place setting as the big bowl of soup is so hot. I put in some broth, noodles and pick out my favourite pieces of seafood starting with squid, abalone and shrimp. When that’s devoured, I spoon in more broth, some noodles and fish. I keep going like this until it’s all gone and I’m figuring out when I’ll be back, or if I should order a Seafood Sukiyaki for take away. 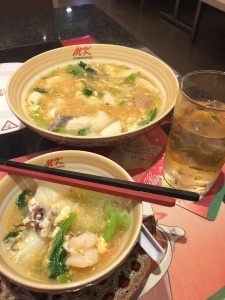 The sukiyaki broth is rather bland and the seafood is steamed without any spices. Sure there are veggies in the soup, but that doesn’t really add much flavour. It must be the special sauce and I sure love this sauce. MK is a good restaurant that is quick and efficient and I sure love going there. Maybe it’s the efficiency of the staff pushing around the little refill trollies of ice tea and special sauce. Maybe it’s the automation with the menu order screens, or the quick response when you press the ‘Call Button’ to summon a waitress/waiter. And I don’t love MK because it’s so cheap. I didn’t realise how inexpensive the soup was until I’d had it many times, and was eating solo. I was paying the bill myself instead of splitting it up with many people and not really paying attention to the cost of each dish, when I realised that Seafood Sukiyaki was 120B, that’s like $4 CDN. The seafood in the dish must cost that much, how do they do it? What can I say, but try an MK Restaurant when you’re in Thailand. I’ve read they are expanding to other countries, so you may be in luck and able to find an MK where ever you are.